We wrote in October about the council’s plan to earmark a number of its housing estates for demolition using an ‘Asset Performance Evaluation Tool’, which would take into account factors like residents’ income. The results of its survey were supposed to be presented at next week’s Cabinet meeting, but the December Cabinet report shows that this has now been postponed until January. Buying affordable housing built through s106 agreements directly from developers. (see para. 58). Southwark’s track record on securing affordable housing through s106 obligations is extremely poor. The viability assessment loophole means that developers often get away with building no affordable housing whatsoever. In those cases where affordable housing is provided, it normally takes the form of shared ownership and affordable rent (80% market), which are of little benefit unless these are the kind of ‘council’ homes that Southwark is looking to provide. We have already reported on Southwark’s loss on the sale of its 25-acre Heygate site at a knock-down price to developer Lend Lease. We don’t know how much it sold the Aylesbury for, but we think it’s unlikely to recover the estimated £150m cost1 of demolishing the 60-acre estate. So it doesn’t need us to point out the absurdity of selling off structurally-sound council estates on the cheap and then buying back land from the private sector in order to build new ‘council’ homes. The December Cabinet report also provided an update on the council’s progress with its 11,000 new ‘council’ homes ‘Direct Delivery’ programme. Phase one of the programme involving the ‘delivery’ of 1,500 new ‘council’ homes by 2018 is now being finalised, with sites for 837 of these new ‘council’ homes now identified. Appendix 2 of the report gives a detailed schedule of these 837 new ‘council’ homes and where they are to be located. The next entry on the Direct Delivery schedule is Willow Walk near Old Kent Road, which is supposedly providing 75 new ‘council’ homes. However, according to paragraphs 5 & 6 of the planning report for this development, the 75 units comprise only 21 social rented homes, plus 54 rooms for temporary accommodation (replacing the existing temporary accommodation unit) - very welcome no doubt but not 75 council homes. Next on the schedule is the site of the former Nunhead Community Centre, which is supposedly providing 8 new ‘council’ homes. What it doesn’t mention is that a large (1000 sqm) council-owned community centre is being demolished to make way for these and that the 8 new council homes will be accompanied by 14 new homes for private sale. Of the 25 new ‘council’ homes built on the former Masterman House garages in Camberwell, only 15 will be social rented; the remainder will also be ‘council’ homes for private sale. Just 34 of the 116 new ‘council’ homes planned for Commmercial Way will be social rented and so the list goes on. We can’t find details for many of the sites listed in the schedule, but we estimate that only around half of the 837 new ‘council’ homes listed will be ‘council’ homes as we know them. The remainder will be shared ownership and ‘council’ homes for private sale, which doesn’t come as a surprise in the wake of the revelations stemming from our reporting of Southwark’s MIPIM attendance this year. The long-running dispute over who should pay for the capacity upgrades to the northern line tube station in order to meet increased demand from developments, has finally come to an end. Southwark News reports that of the £154m total cost, TFL have agreed to pay £91m while the council is left to find the remaining £63m. 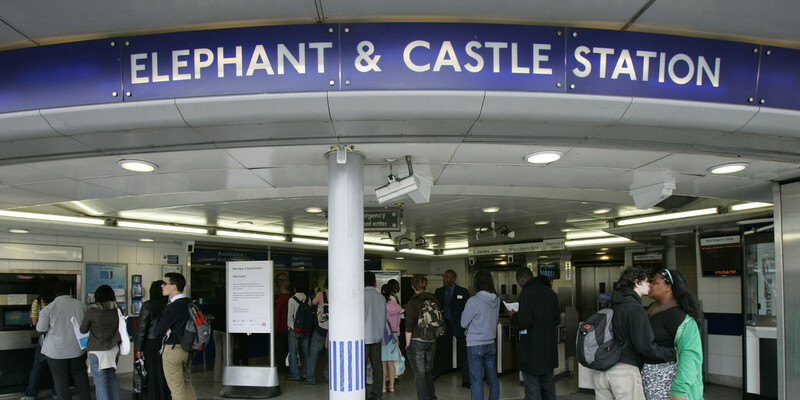 The council’s regeneration partner Lend Lease is making a contribution of just £16.3m4 towards the council’s bill - proof that the regeneration partnership is not an equal one, with Southwark bearing the lion’s share of costs and Lend Lease reaping the Elephantine profits. 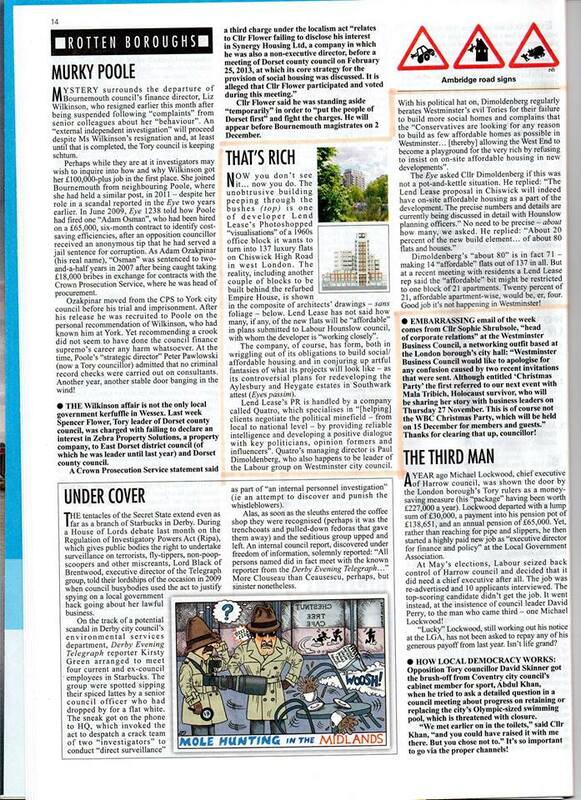 Lend Lease got a mention in the latest edition of Private Eye. This time for a development in Chiswick, where its PR firm have been accused of producing misleading imagery. The column also pointed out that Paul Dimoldenberg, the head of Lend Lease’s PR firm which created the images, also happens to be leader of the Labour group at Westminster council. We can add that Cllr Dimoldenberg also used to be a senior council officer at Southwark. Our hats go off to Mr Dimoldenberg’s firm for its PR image trickery. The following is a visualisation image from the Heygate application. New photographs have been published showing what the Art Deco Coronet building looks like behind its corrugated blue facade. The Coronet is currently under threat of demolition from the shopping centre redevelopment. The shopping centre and neighbouring site are being redeveloped by real estate hedge fund DV4. George Soros backed DV4 is based in the British Virgin Islands and managed by Delancey’s Jamie Ritblatt. The Theatres Trust has recently submitted an application to have the Coronet listed. You can read more about the campaign on the Theatres Trust website, the Save the Coronet campaign web page and this article by the Guardian’s Dave Hill. After being unlawfully evicted from his home, having his possessions destroyed and being left street homeless by Southwark council, a Sudanese refugee won a long-running court case against the council in October. After spending six-figure sums on top QCs to fight the case against the claimaint (who had no legal representation), the council declared last week that the trial was ‘unfair’ and ‘clearly wrong’. An article about the case by the Giles Peaker, a partner specialising in housing at solicitors Anthony Gold, sums up Southwark’s attitude well: “disingenuous in the extreme”. The ongoing battle to disclose the Heygate development viability assessment continues. The Information Tribunal has called a final hearing on 21st January to resolve the ongoing dispute concerning the implementation of its May 2014 decision notice. The hearing will be in closed session attended only by Lend Lease & Southwark’s counsel, who will recieve directions as to exactly which of the 22 appendices can be withheld. The Tribunal had previously ruled that the financial model in appendix 22 and the figures related to commercial negotiations for its retail floorspace could be withheld, but there has been a dispute over exactly which of the 22 appendices are related to these. We are expecting the Tribunal to order the viability assessment be disclosed within a short period after the hearing (barring further appeals and heeldragging by Lend Lease & Southwark). After nearly 3 years of battling for its disclosure we are looking forward to finally being able to see why Lend Lease has been so reluctant to show its sums.